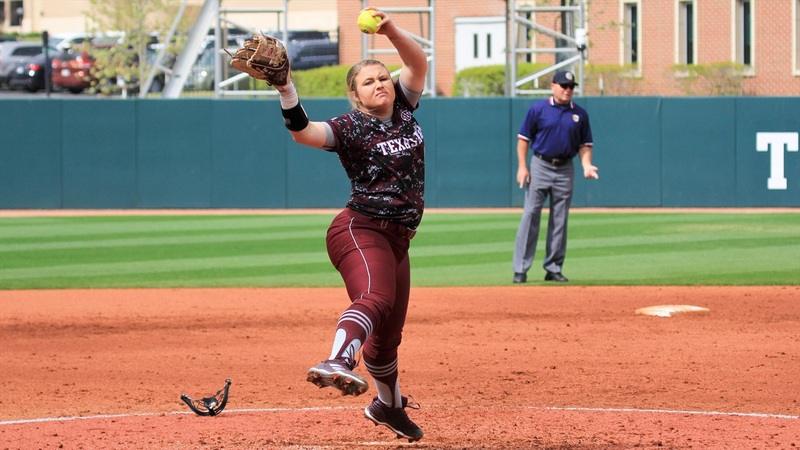 The Aggie softball team defeated the Sam Houston State Bearkats, 4-3, in the first game of a doubleheader at Davis Diamond on Wednesday afternoon. The first inning saw quite the start by the Aggie bats. Kelbi Fortenberry, Blake-Ann Fristch and Baylee Klingler each singled to load the bases for Aggie shortstop Riley Sartain, who plated a run off a fielding error by Bearkats third baseman Kyndal Kutac. The Bearkats’ defense began to find their groove and recorded two quick outs to retire the next two Aggie batters. Dani Elder would add another run in the bottom half of the first to give the Aggies a two-run lead heading to the second inning. The top half of the second inning saw the Bearkats respond. A pair of singles and a hit batter loaded the bases for Sam Houston. With no outs and the bases loaded, Kutac would step up to the plate for the Bearkats and redeem herself for her earlier fielding error with a sacrifice fly to right field to cut the Aggie lead in half. The next two batters would go down in order, and the score remained 2-1 heading to the bottom frame. A lead-off walk by Aggie designated player Morgan Smith put a runner on base early in the second. For the second consecutive inning, back-to-back outs to shortstop placed the Aggie in another two-out situation. Baylee Klingler stepped up to the plate and delivered once again. Klingler recorded an RBI double to center field, recordeding her second hit of the day. The Aggies took another two-run lead heading to the third inning, 3-1. After a quiet third inning, the Aggies would once again load the bases in the fourth, this time for Aggie pitcher Payton McBride. McBride singled up the middle and increased the lead to 4-1. A double play by Sam Houston ended the inning. Aggies starting pitcher Payton McBride remained on the mound heading into the final inning. The Bearkats would not go away quietly, and scored a run with two outs, to pull within one. With a runner on first base, Sam Houston State second baseman Brooke Malia stepped to the plate with a chance to tie the game. She proceeded to line a ball towards right field, where Aggie right fielder Kylie George made an incredible diving catch to end the game for the Aggies. Aggie starter Payton McBride improved her record on the season to 8-3 and finished with four strikeouts and only one walk.